That’s rather inconvenient, though. Wouldn’t it be easier if you had a nice OS X application that would let you minify your code right from your Mac? Enter Minimus, the app I just finished. 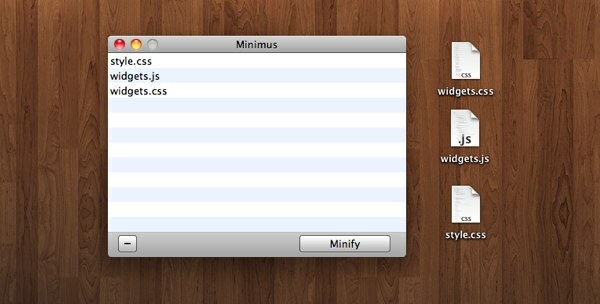 Minimus is a handy GUI frontend for the YUI Compressor. All you have to do is drag one or more files onto the dock icon, hit a button, and in seconds you will have minified copies. It’s a free download, but if you like it, feel free to send me $5 or so with the in-app PayPal form. This is either a useful tool or a fun toy. Websites as Graphs is a Java applet that renders your website’s (X)HTML structure as a graph of colored dots. You enter a sites’ URL into the form, and the applet puts a black dot on the screen (representing the root <html> element). Quickly, more connected dots expand outward. Each dot is color-coded to match a group of elements. The blue dots are links, the red ones are tables, etc. The graph shown to the right shows this site (note the lack of red dots ). It’s fun to enter a bunch of your favorite websites and compare them (maybe it is a toy rather than a useful tool…), and compare them to your own as well. Try it out, it’s fun to watch if anything. LastRSS. MagpieRSS. Neither have been updated in over a year. What’s the best way to parse RSS feeds and output them with PHP? Simple, use SimplePie. What is SimplePie? It’s a file you include in your PHP scripts, allowing you instant access to RSS-parsing capabilities. You can display RSS headlines/items on your website, combine several feeds into one, and anything else that you can think of. If you know a little PHP, the possibilities are endless. That’s all you need to display a feed’s headlines and descriptions. Of course, that was only a simple example. It’s unbelievable what you can do with SimplePie. Over at NTugo, SimplePie is used extensively. The MyNT RSS reader is powered by SimplePie. The “Recent blog posts” and “Recent posts from the NTugo Network” boxes on the home page are built with SimplePie. The RSS feed aggregated from all of the NTugo blogs? SimplePie again! It’s amazing what you can do with SimplePie. If you know PHP, you’ll definitely want to take a look at SimplePie. RSS is one of the greatest web technologies invented in the last ten years. It enables us to keep up with our favorite sites, listen to podcasts, and get niche news easily. Forget annoying old newsletters! Who needs them when you can just open your RSS reader and skim through headlines, looking for things of interest? Ah, the RSS reader. Like with web browsers and email clients, everyone has a different preference. Some like desktop programs, while others like web-based apps. There’s no shortage of choices. You have Feedreader, Netvibes, Bloglines, etc. I don’t like any of the choices. I’m a big fan of RSS, but I’ve never really liked any RSS reader other than Firefox‘s Live Bookmarks feature. Recently I’ve had two problems. Number one, my feed collection outgrew Live Bookmarks. Number two, I’ve often wanted to read my RSS feeds on other computers. What did I do? I threw together my own web-based RSS reader. I call it MyNT (say “Mint”), which is short for My NTugo. It’s a little innovative, as I added a few…different features to it. My favorite feature: You can read your RSS feeds without logging in at all (just go to http://my.ntugo.com/yourusername.html). Just bookmark that URL and you can check your feeds with a single click (let’s see Bloglines do that). Take a look at MyNT, you may like it. I can’t guarantee everyone will like MyNT. After all, I made it mainly for myself (and anyone who thinks that most feed readers are too bloated). I wanted to capture the simplicity of Live Bookmarks in a different form, and I think I did a pretty good job at it. Well, MyNT’s URL is http://my.ntugo.com, and you can read the official press-release-sort-of-thing here. Those are just a few examples of what AjaxLoad can do. So, you’ve got yourself a domain. Sure, it helps people get to your website, but what else can you use it for? Google’s got the answer. Do you hate your webhost’s webmail program? Do you like GMail? Well, now you can have your own copy of GMail (with 100 free email accounts)….but at your own domain. That’s right, you can have your own mini-GMail with email addresses resembling you@yourdomain.com. You get more than just email, but the email’s the best part. Forget your host’s SquirrelMail system, switch to Google Apps. Wouldn’t it be cool if you could easily manipulate HTML elements onscreen? Wouldn’t it be nice if AJAX requests could be sent with only one line of code? Take a look at Script.aculo.us. Just so you know, the “infos” fields are the places where you paste you’re blog’s template tags. For example, if you have a blogger blog, you’d paste <$BlogItemPermalinkURL$> into the “url” field. This site is a great way to add social bookmarking links to your site.